My two daughters and I just returned from our mission trip in West Virginia this afternoon. I am very tired tonight, so I'm not going to try to write all the ways that this trip impacted me now. In fact, I think I will be processing this experience for some time to come and I hope to write about some of those thoughts here. For tonight, I will say that I am VERY grateful that I went to West Virginia. I will never forget this trip. One of the things that I am noticing tonight is that I feel a bit overwhelmed by the contrast of the two worlds. The luxuries and conveniences which I normally take for granted (air conditioning, stores on every corner, cell phone service, a clean comfy place to sleep) seemed so necessary before the trip. As I return to them after a week without them, they feel strange and foreign and maybe a bit indulgent. Don't get me wrong; I am THRILLED to be in air conditioning again and I flipped that cell phone open the minute we got into range of a cell phone tower. It's just that they seem less essential now after seeing the joy that can be found in SO much less. I will write more about the family that my team served when I am more coherent. J.B. and Max are my new friends in West Virginia and J.B. maintains that Jesus sent us to help them. That is certainly true, but I'm not sure Jesus didn't also send me there to remind me of a few things I needed to remember. 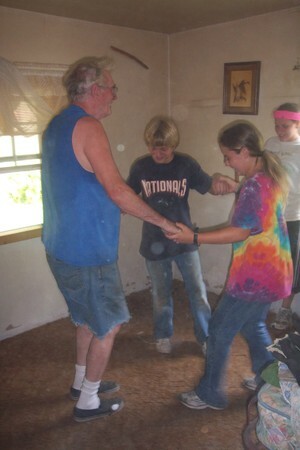 As J.B. says "there ain't nothing but Jesus, darlin'"
We fixed the broken, rotting floor in their broken little house. J.B., who fancies himself quite a dancer, decided to do a dance on the floor after we finally got the hole closed up. This picture is my favorite from our trip...he is dancing with two of the precious middle school students on my team, Nick and Lindsey. I hope you can feel the joy of this moment....a moment fueled by love and sacrifice and our common humanity. And by a connection between a group of people that believe that our God is SO personally involved with our lives that he would send a bunch of upper middle class teenagers to serve a poor old man in West Virginia. The same God who knew that those teenagers and a very comfortable middle-aged homemaker would find that they, in attempting to serve, had been served....in attempting to offer a blessing, had received one instead. As J.B says, "there ain't nothing but Jesus."